Chances are your desktop has changed a bit since you first plugged in your computer. So what about your phone? 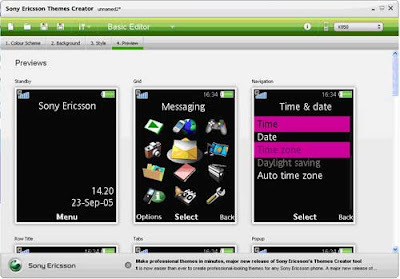 Now there's an easy way to personalize your Sony Ericsson mobile so you really feel it belongs to you. Themes Creator is a free tool that lets you choose the colour scheme, decide on the graphic style, pick the background images, easy to use, with three levels to suit everyone from a novice to a professional designer and so on. So now your phone can reflect your mood or your interests; you can make it more flamboyant or minimal, or angular or friendly … or just cooler.